When faced with relocating an aged 450 KHz Oscillator Tube-Style Power Supply, a hydraulic fitting manufacturer turned to Pillar Induction or guidance. 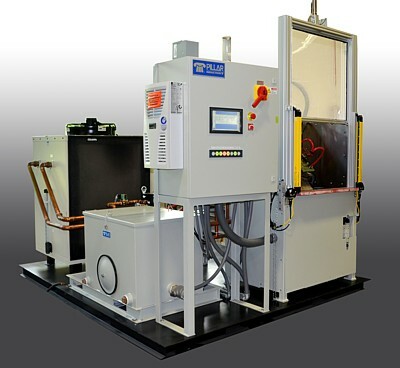 Pillar’s team of engineers determined a Solid State Style, 50 KHz Power Supply would perform the same heat treating task, while utilizing all of the existing induction coils and part locating tooling. Pillar then manufactured and installed an MK-11 power supply and heat treat system for this manufacturer. The lower frequency ushered in the leading-edge technology of the Pillar MK-11 power supply. The MK-11 is an IGBT-based power supply with a PLC/HMI operator interface with Ethernet connectivity. The system controls provided all of the part recipe information including the part number being run, tooling part numbers, process parameters and induction coil part numbers. Previously, this information was recorded on set up sheets found on the side of the machine. In addition to a state-of-the-art controls platform, the system featured all of the required NFPA and OSHA requirements such as light curtains, guarding, a low-voltage controls platform and today’s standard process safeties. According to the hydraulic fitting company’s project manager, “Utilizing the existing induction coils and tooling was a key factor in the decision, saving us tens of thousands of dollars.” Pillar Induction provided a turn-key solution for this manufacturer. The equipment installation, commissioning, training and preliminary acceptance occurred over the course of two weeks. Pillar Induction, based in Brookfield, WI USA, is a leading supplier of induction heating and melting equipment for the foundry, heat treating, bar & tube (OCTG & API), forging & forming, and vacuum induction melting industries.